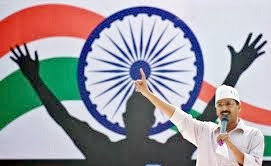 As there is an ongoing peoples referendum – the thinking within us is – AAP should accept to form a government in Delhi. 1. People are greatly looking forward to a total change in the style in which the present day politicians conduct themselves, and the AAP symbolizes this hope more than ever before. Even a few months in office by the AAP will usher in a much desired new way of governance that will give a concrete shape to this aspiration, which remains only a promised distant dream at present. 2. AAP has made clear governance objectives brilliantly in your letter to the BJP and Congress. While both parties have given wishy washy replies, neither of them have rejected your views, nor withdrawn their offers of outside support. This has successfully created an excellent opportunity for AAP to expose their past and future misdeeds..
3. The expectation of the BJP and Congress (that AAP government will find it impossible to carry out the targets they have promised to achieve) is only a desperate hope, far from reality.. People will greatly welcome the spirit of actual actions for translating promises into reality. It will make no difference to the public mood and support if, for instance, the electricity rates do not come down by full 50% as long as there is a visible and honest effort to bring them down. 4. Governance is not, as rightly stated, a rocket science. If intentions are in the right direction, openly and transparently without any ego hassles or a hidden agenda, governance is not a complicated matter. Also, since the AAP enjoys high admiration at a wide scale, it would not be difficult to muster totally free and wholehearted support of a large number people living in Delhi who have high experience in various technical and administrative areas. As such, the objective of fulfilling the promises made by AAP is not so difficult as it is being propagated by vested interests. 5. It is no longer possible for the BJP or Congress to easily withdraw their support to the AAP government. The BJP would like to keep AAP preoccupied in running their government in Delhi, which will compel AAP to limit their participation in 2014 parliamentary elections, leaving BJP free to combat Congress as their principal adversary. In fact, even in the unlikely event of the Congress withdrawing its support to AAP, BJP can easily let the government continue simply by abstaining from the Assembly on the day of voting on any no confidence motion. As for the Congress, which has tied itself in knots through thoughtless decisions flowing from the top, the right strategy for the AAP government would be to take up enactment of new laws step by step, starting with those that have the least chances of opposition by the Congress (e.g. avoiding hurry in starting investigations into misdeeds of Smt Sheila Dikshit government, which may well have wider dimensions). The initial efforts should be to take up constructive areas where people see visible benefits coming to them as early as possible. Courtesy strategist, Sh Sharat Kumar NNFI CIRI Management stalwart, for & on behalf of Civil Society Allnc. Anyone can change everything with right amount of Passion. Happy Independence Day. Always moving ahead towards a strong NATION. Join the journey.